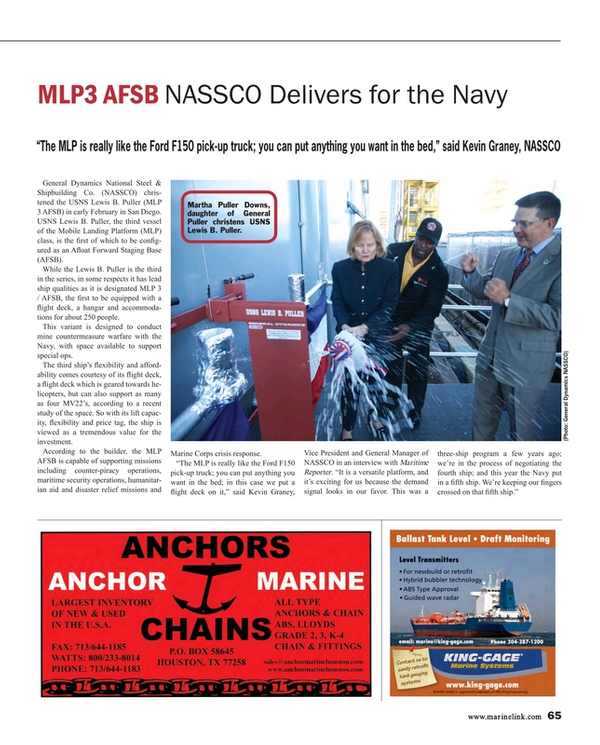 General Dynamics National Steel & Shipbuilding Co. (NASSCO) christened the USNS Lewis B. Puller (MLP 3 AFSB) in early February in San Diego. USNS Lewis B. Puller, the third vessel of the Mobile Landing Platform (MLP) class, is the first of which to be configured as an Afloat Forward Staging Base (AFSB). While the Lewis B. Puller is the third in the series, in some respects it has lead ship qualities as it is designated MLP 3 / AFSB, the first to be equipped with a flight deck, a hangar and accommodations for about 250 people. This variant is designed to conduct mine countermeasure warfare with the Navy, with space available to support special ops. The third ship’s flexibility and affordability comes courtesy of its flight deck, a flight deck which is geared towards helicopters, but can also support as many as four MV22’s, according to a recent study of the space. So with its lift capacity, flexibility and price tag, the ship is viewed as a tremendous value for the investment. According to the builder, the MLP AFSB is capable of supporting missions including counter-piracy operations, maritime security operations, humanitarian aid and disaster relief missions and Marine Corps crisis response.